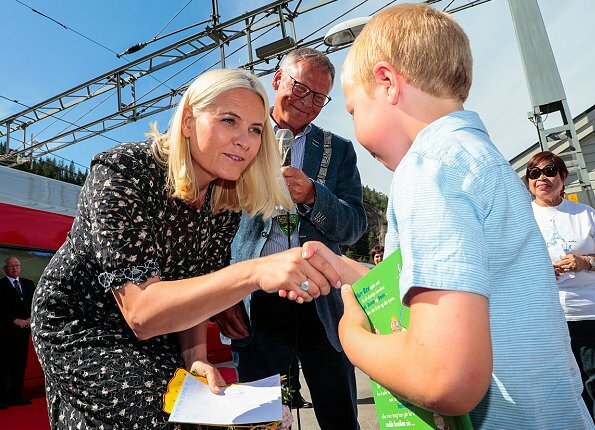 The first stop is Marnardal train station on June 7. 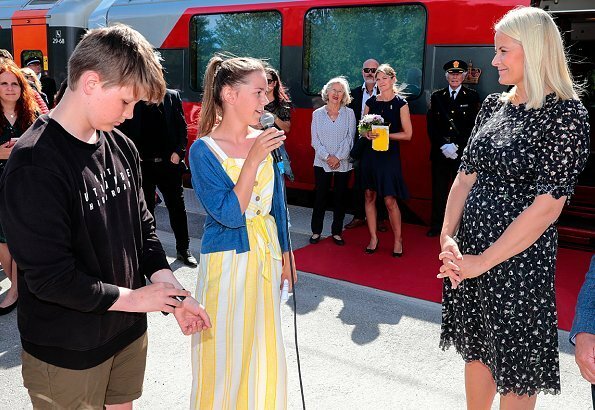 Crown Princess Mette-Marit wore her Valentino dress in Marnardal. Along the way from Kristiansand to Stavanger, the literature train stops at Mandal, Egersund and Ogna. The second stop is Mandal on June 7. 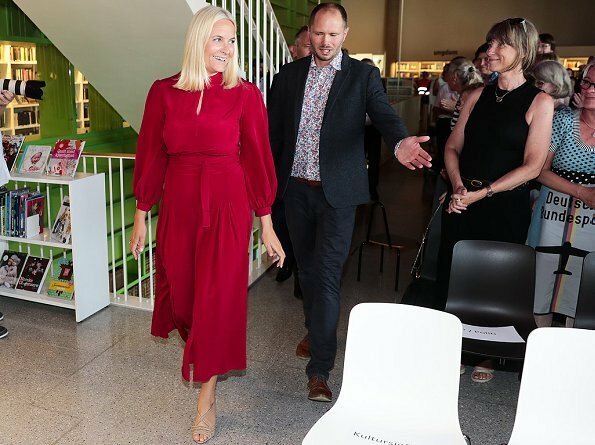 Crown Princess Mette-Marit wore her Raquel Diniz Armonia silk dress and Prada sandals in Mandal. Along the way from Kristiansand to Stavanger, the literature train stops at Egersund and Ogna. 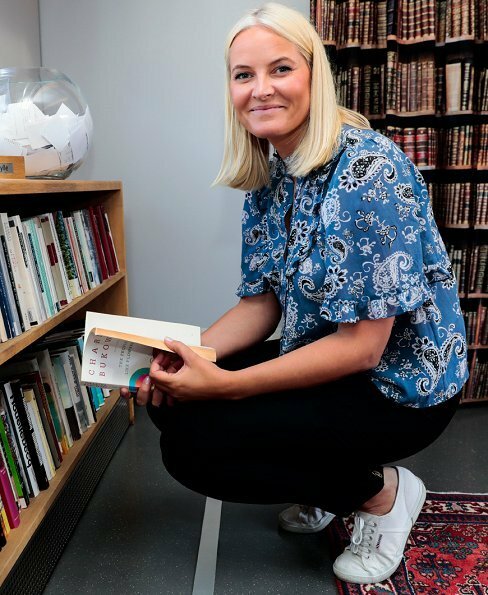 Mette Maritt lokks best in casual clothes and happiest. But why again buttoned up to the top button? I would have preferred a white pair of trousers like the model for a more summery look. Also the blouse needs to be a little longer for her. But she looks good and at least the blouse has the right size, that makes such a difference. I want to add something. In this outfit, we can clearly see that MM ist not overweight. She has a healthy and sportif figure. The unflattering impression we sometimes get is because she unfortunately goes so often for cuts and colors that don't suit her or chooses the wrong size. I will never understand why. Pretty, comfortable casual outfit. The black pants are slimming on her, nice! Her smile is one of her best qualities, so welcoming and friendly! MM looks always best in casual outfits (or national costumes). Nice blouse, the colour is perfect for MMs blonde hair. 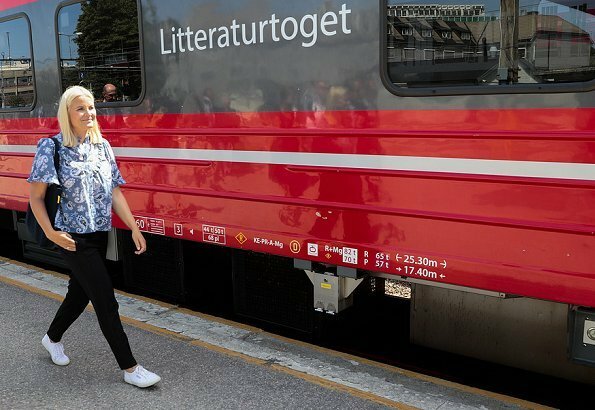 A Literary Train, what a good thing in the wides of beautiful Norway! Lovely casual outfit, beautiful princess. She looks good here. MM always does relaxed casual very well. 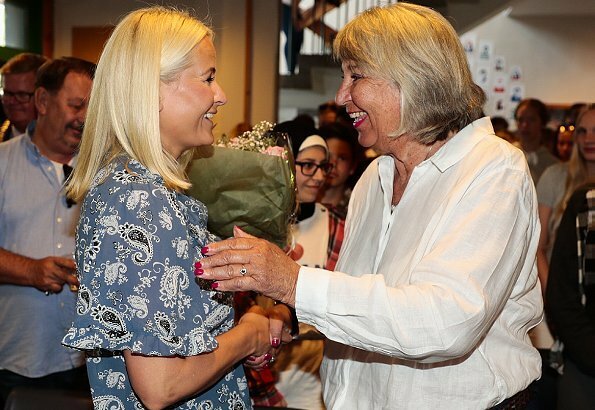 As always, Mette Marit looks her very best when she wears casual clothes! 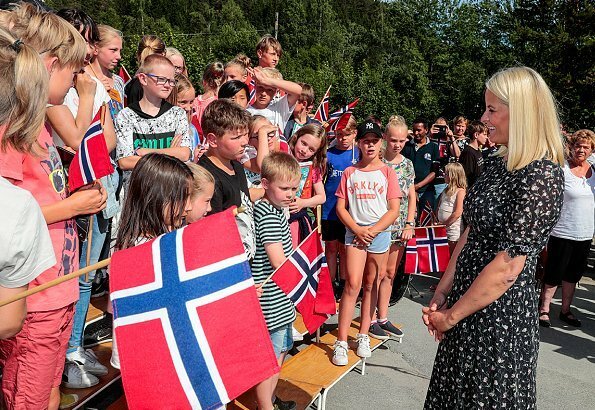 See now, Mette-Marit? A lovely loose top that hangs nicely makes you look thinner. She looks great! MM today in a casual outfit good fit and great smile. She looks happy. Very pretty top - I think I prefer it with white trousers as on the model but she looks good. I love the idea of a literary train. MM is looking lovely today. 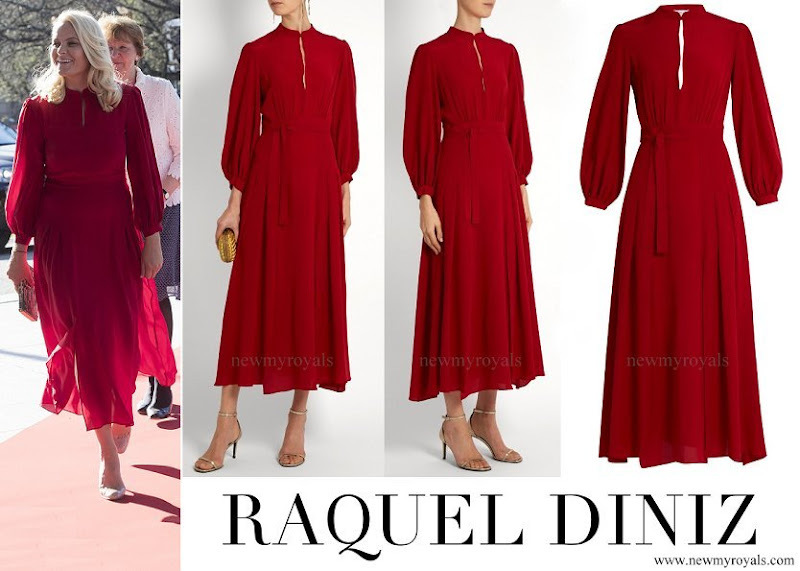 Love this red dress and Mette Marit looks so good. Casual,jeans and trousers, suit her very well. Dresses often make her looking matronly what she definitely is not. Her figur ist not so slim like CP Mary but absolutely normal for a woman in her 40 who has given birth to 3 childs. I like her friendly smile and her classic face. She seems to be very down-to-earth. To Helen: I see that you have added more photos to this post featuring not one but two new dresses on MM. I fear many followers will miss these photos because there are now many posts above this one and they have already commented on the initial 'casual look' and won't know about these new photos. MM looks very good in the new outfits; perhaps you should have created a new posting on their own for the credit they deserve. Maybe you can still move them? They are very nice dresses and MM looks very good in both of them. Thank you. Agree as well. The 2 dresses look very nice.